The School is located in Bloomsbury in Central London. Due to the School’s central location transport facilities are excellent. These include underground stations at Goodge Street (Northern Line) and Tottenham Court Road (Northern and Central Lines), as well as national and international rail stations at Euston, King’s Cross and St Pancras and St Pancras International which are a few minutes walk away. There are several bus routes serving the area. In 2017, a new railway system for London will open. Crossrail will link Maidenhead and Heathrow in the west to Shenfield and Abbey Wood in the east, with a station on the new route serving Tottenham Court Road, about 5 minutes walk away from the School. The nearest underground stations to the School are: Goodge Street (Northern Line), Tottenham Court Road (Central and Northern Lines), Russell Square (Piccadilly Line), Euston Square (Circle, Metropolitan and Hammersmith & City Lines) and Warren Street (Northern and Victoria Lines). All these stations are located on the “How to Find Us” map. Buses 10, 24, 29, 73, 134 and 390 stop in Gower Street southbound and the Tottenham Court Road, northbound. Buses 1, 8, 14, 19, 25, 38, 55, 98, 176 and 242 stop in New Oxford Street and buses 7, 59, 68, 91, 168 and 188 in Russell Square. 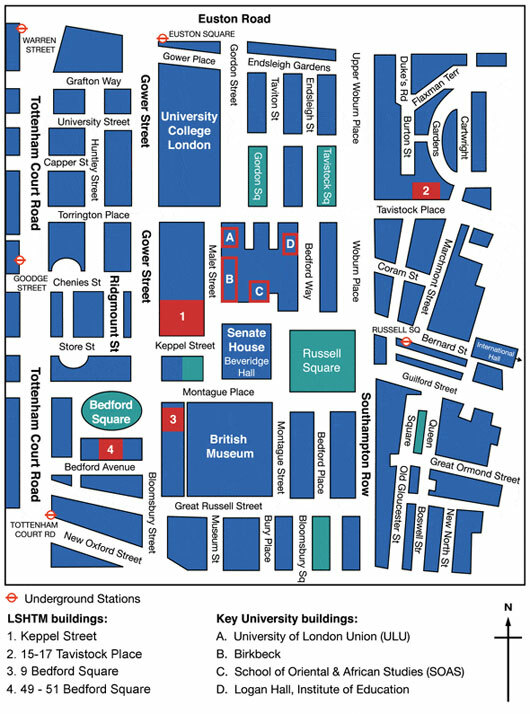 Euston, St. Pancras and King’s Cross are a short walk (10-15 minutes) from the School’s buildings. Other London mainline stations are a short tube bus or taxi journey away. An international rail service is available from St Pancras International with trains to Brussels and Paris with onward European Destinations. There is no parking at any of the School’s sites. There are pay and display bays in nearby streets but they are expensive and regularly patrolled by parking wardens. In addition, there is a daily Congestion Charge for driving into this part of Central London. Designated bicycle parking stands are available on the pavement in Keppel Street, Malet Street and on Bedford Square. The School can easily be reached from all of London’s major airports. London Heathrow is on the Piccadilly London Underground Line and the nearest station to the School is Russell Square, (approximately 45 – 50 minutes). Alternatively, there is a high speed rail link from London Heathrow to London Paddington (approximately 15 minutes) mainline station from where you can take the Circle Line to Euston Square. London Gatwick has train services directly into London Victoria (approximately 30 minutes) mainline station, where tube trains, taxis and buses are available. London City airport is served by the Docklands Light Railway (DLR). Take the DLR to Bank station and change onto the Central Line (westbound) to Tottenham Court Road, (approximately 40 minutes).